fiveWINDHAM — There’s no doubt about it: adulting can be hard. But thanks to a new course being offered at Windham High School this year, students can get a jump-start on certain life skills that may come in handy in the real world. 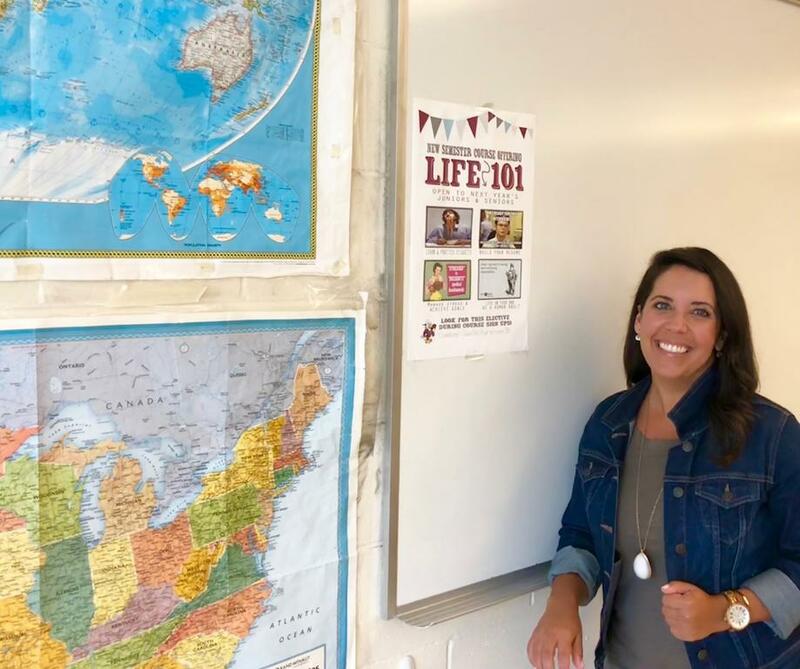 Starting this fall, social studies teacher Kelly-Anne Rush will be teaching Life 101, an elective for juniors and seniors. Students will be taught “adulting skills,” such as basic etiquette, how to change a tire, the do’s and don’ts of a professional interview, how to put together a resume, and more. The idea for Life 101 came from a similar one-week unit that Rush and a colleague taught when she was at Lakes Region High School in Naples. “Basically, if you were to ask any adult on the street what they wished they had learned in school but they didn’t learn, that’s what we’re going to teach them,” she said. Rush, 37, is in her sixth year at Windham High School after teaching for eight years at Lakes Region. She has a bachelor’s degree in secondary education from the University of Maine and a master’s from the University of New England. She has her own blog – craftyteacherlady.com – where she discusses her various experiences as a teacher, renovator, homeowner, decorator and style enthusiast. She is also starting her fifth year teaching a personal finance course at the high school, which is now a requirement for all Windham High School seniors. Rush, who spearheaded the creation of the course five years ago and was one of two teachers to teach it initially, said it covers topics such as budgeting, money management, taxes, analyzing pay stubs, saving and investing, financial pitfalls, identity theft and insurance options. “At that time, there really wasn’t one place you could go to get a lot of curricular resources for teaching personal finance,” she said. After attending a Maine JumpStart conference in Augusta, Rush learned about the organization Next Gen Personal Finance, which offers online curriculum resources. This summer, she participated in the Next Gen June Summer Institute in Palo Alto, California, and will serve as a NGPF fellow this year. “Part of my goal for this next year is, obviously not only taking some of the curriculum resources that I was introduced to in California back to my students, but also acting as an advocate as much as I can in my community and in the state, and even nationally,” she said. Rush said Windham is “ahead of the curve” with its financial literacy course and she hopes to support similar initiatives in other Maine school districts and help “point teachers in the right direction” when they are looking for resources. Teaching the personal finance class has been “extremely rewarding” for Rush, especially when former students reach out to her to say how the information they learned has helped them navigate financial decisions such as signing a lease. Windham High School teacher Kelly-Anne Rush is teaching a new class this fall called Life 101.